OVERALL AMATEUR MR. UNIVERSE was the sensational Tim Belknap of USA; PRO MR. UNIVERSE was the incredible Ed Kawak of Lebanon/W. Germany; JUNIOR WINNER AT THE UNIVERSE was the amazing TONY FRANCIS of UK. Amateur and Professional male bodybuilders featuring: Tim Belknap, Ed Kawak, Bob Reis, Eugene Laviscount, Charlie Clairmonte, Andre Maille, Gary Lewer, Joe Bucci and many more champions. 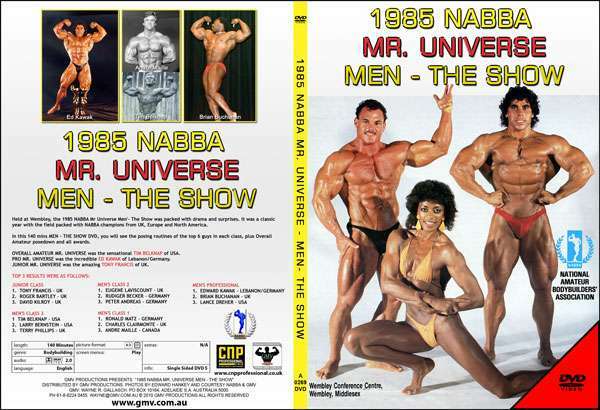 Held at Wembley, the 1985 NABBA Mr Universe Men – The Show was packed with drama and surprises. It was a classic year with the field packed with NABBA champions from UK, Europe and North America. 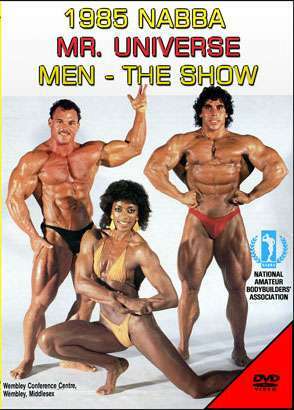 OVERALL AMATEUR MR. UNIVERSE was the sensational Tim Belknap of USA. PRO MR. UNIVERSE was the incredible Ed Kawak of Lebanon/W. Germany. JUNIOR WINNER AT THE UNIVERSE was the amazing TONY FRANCIS of UK. In the PROFESSIONAL CLASS, it was a great battle between EDWARD KAWAK, BRIAN BUCHANAN and LANCE DREHER. The final results also ended up this order with Dreher having to wait a further 12 months to finally claim this title. In the Junior Class staged at the Universe it was down to the wire between 3 amazing young Brits in TONY FRANCIS, ROGER BARTLEY and DAVID KILROY with that also being the order on which they finished. The OVERALL AMATEUR MR. UNIVERSE was the sensational Tim Belknap of USA. The PROFESSIONAL MR. UNIVERSE was the incredible Ed Kawak of Lebanon/W. Germany.